The ECHL’s Toledo Walleye have announced that they will be hosting “8-Bit Night” at a November 21 home game. Not sure what that is? It won’t matter once you see the jerseys. 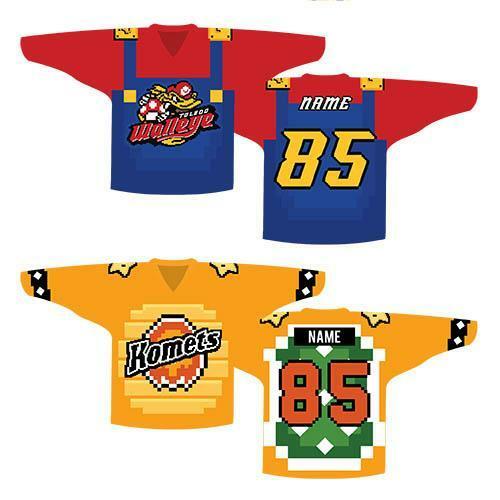 The team is celebrating the 30th anniversary of the NES with a Mario-themed jersey and they’re bringing the Fort Wayne Komets into the fun by turning their jerseys into a mash-up of the Komets jersey and Bowser. Take a look at the jerseys below. I hope that between periods we can get some Duck Hunt going on the jumbotron and that afterward the teams will take part in an Excite Bike tournament, which my cousin Jacob would have dominated if he was still nine.